Chillers allow effective management of aquarium water temperature. inhabitants such as corals will benefit greatly from aquarium water chillers. you have probably heard of aquarium heaters already; equipment that will heat up the water and make it possible to house species that require a higher water temperature than the air surrounding the aquarium. An aquarium chiller does just the opposite; it chills the water and makes it possible to keep species that need a lower water temperature. To make it possible for you to set the optimum temperature for your particular aquarium, the aquarium chiller is equipped with a thermostat control unit - just like a heater. When shopping for a chiller, there is more than one solution to choose among. A single-stage controller will control only the chiller, while a dual-stage controller will control a chiller AND a heater. It might sound strange, but in many situations you may need to use a chiller as well as a heater to keep the correct water temperature in the aquarium and a dual-stage controller will help minimize variance and eliminate conflicts between the two. You wish to keep cold water species indoor and decreasing your indoor temperature low enough is not an option. You live in an area subjected to seasonal heat-spells that increase room temperature and wreck sudden havoc in your aquarium. You live in a warm part of the world and decreasing your indoor temperature low enough is not an option. You have installed heat emitting equipment that increase the water temperature, e.g. pumps and lights. Many people think that aquarium chillers are only necessary if you wish to keep species from temperate or arctic parts of the world, but this is very far from the truth. A subtropical species used to a water temperature of 18-25C can for instance suffer if a sudden heat spell turns the air temperature in your house up to 30C. Also keep in mind that the water temperature tends to drop sharply with depth and deep-water species can therefore require really chill water even if they hail from the tropics. A common mistake is to unplug the aquarium heater when a chiller is used. This is usually not a good idea, because an unplugged heater can cause the temperature to drop too far, e.g. if the weather suddenly changes or if you live in a part of the world where the days are hot and the nights cooler. A properly working heater with a thermostat will shut off as soon as the water has become warm enough and it can therefore be used together with a chiller. The chiller itself will actually emit quite a lot of heat. It is therefore not a good idea to enclose the chiller or place it inside aquarium furniture unless the furniture is very well ventilated. When choosing between two chillers, go for the more powerful one. You will usually get more bang for your buck by purchasing a really powerful chiller. Even weak chillers tend to be quite expensive, and the price does not increase proportionally to capacity as you upgrade to a more powerful piece. By getting a chiller that is more powerful than the minimum recommendation for your aquarium, you will normally end up with a chiller that lasts much longer before it has to be replaced than a weaker chiller would. 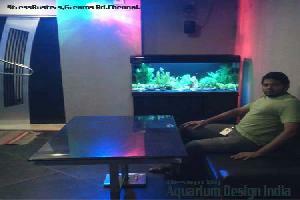 Keywords : Aquarium Accessories, Aquarium Chillers sale in chennai,Marine tank chillers buy in chennai.